When you're five years old and just learning about the world around you and its inhabitants, it's okay to be a little apprehensive when you encounter a giant prickly stick insect with thornlike spikes. Even if your mother is holding it. Such was the case when Kira Olmos, 5, of Winters visited the Bohart Museum of Entomology last Saturday with her mother, Kendra Olmos, executive director of the Center for Water-Energy Efficiency, UC Davis Department of Civil and Environmental Engineering. The occasion: a Bohart Museum open house featuring 10 UC Davis student fly researchers presenting their work. Together they transformed the old adage, "Time flies when you're having fun," into "Time's fun when you're studying flies." Time's fun also when you're checking out the Bohart Museum's "petting zoo!" The petting zoo, a popular part of the Bohart, includes Madagascar hissing cockroaches, stick insects (also called walking sticks) and tarantulas. 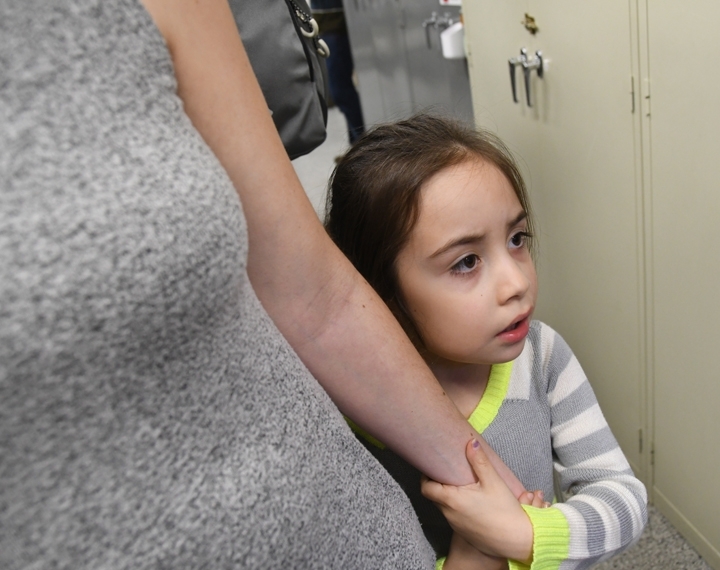 Visitors of all ages--well, most ages--enjoy holding them, photographing them, and asking the museum scientists about them. 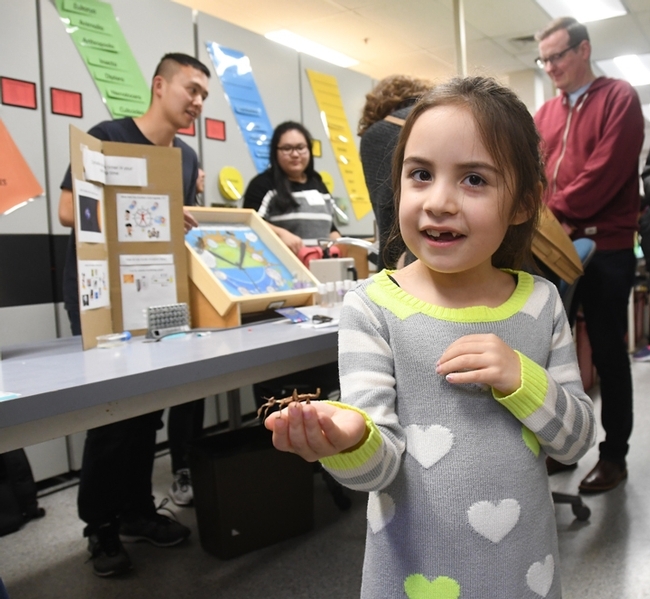 It's a good way to introduce youngsters to the wonderful world of insects. Little Kira Olmos first colored an insect illustration at the fly researcher table staffed by graduate students Christine Tabuloc, Yao Cai and Xianhui "Nitrol" Liu, and undergraduate students Cindy Truong and Christopher Ochoa of the Joanna Chiu lab. Then it was time to check out the stick insects. Kira edged closer as a crowd formed around handler Emma Cluff, a recent UC Davis graduate and Bohart associate. Cluff was cradling a five-inch Australian walking stick, Extatosoma tiaratum, a critter covered with thornlike spikes for defense and camouflage. If a picture is worth a thousand words...her expression is...priceless. "Too funny," commented Lynn Kimsey, director of the Bohart Museum and professor of entomology at UC Davis. "She's really not sure she wants to be on the same planet as that stick insect!" 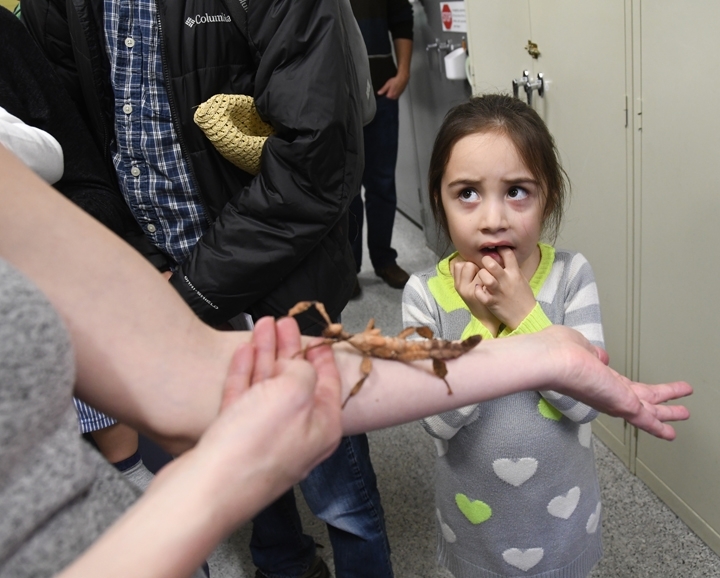 The Australian stick insect definitely drew Kira's attention. Yes, insects are cool. Even when you're five years old and you meet your first giant prickly stick insect. 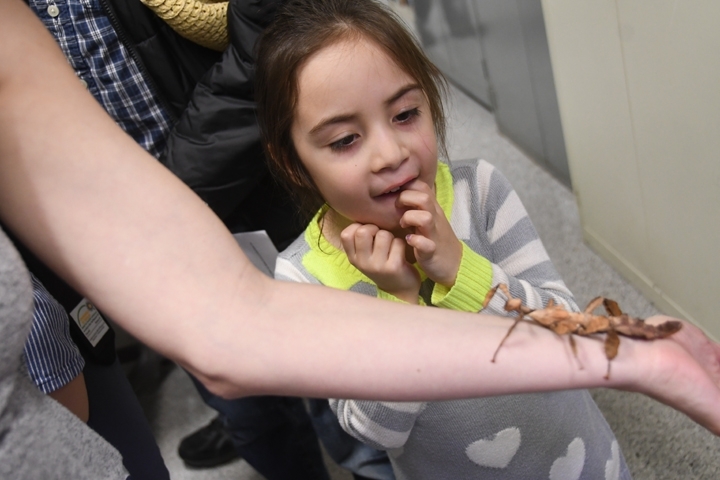 The Bohart Museum, located in Room 1124 of the Academic Surge Building on Crocker Lane, UC Davis campus, is the home of nearly eight million insect specimens, plus a year-around gift shop and petting zoo. It is open to the general public Mondays through Thursdays, from 9 a.m. to noon and from 1 to 5 p.m. It hosts occasional, weekend open houses​. Admission is free. Further information is available on the Bohart Museum website at http://bohart.ucdavis.edu/ or contact (530) 753-0493 or bmuseum@ucdavis.edu.